The upper limit of the shutter speed in Manual Exposure Mode has been raised (max. 250 seconds). [HIGH ISO NR] for ISO 1600 and ISO 3200 has been added to the [REC] menu. When [MF] is set, you can make fine adjustments to the focus using a simpler operation than before. Improved auto white balance performance. • The position and size of the AF area you have set are now stored. [ACTIVE MODE] has been added to the [MOTION PICTURE] menu. The AF/AE Lock operated by half-pressing the shutter button has been improved. [MONITOR] / [VIEWFINDER] has been added to the [SETUP] menu. The new S2 firmware adds support for the new S-Lens Leica Elmarit-S 30 mm/f2.8 ASPH. Improved Auto White Balance in conditions with power saving lamps and tungsten light. Firmware Version 1.2.1 is for cameras with firmware up to version 1.2.0. If the camera’s firmware is already version 1.2.1, it is not necessary to update the firmware. Note that cameras with firmware Version 1.2.1, 1.2.0 cannot be downgraded to a previous firmware version (such as Version 1.1.0). Be sure to read the instructions on the download page before proceeding with the update. We’ve received several phone calls starting today about Leica’s new firmware for the M9. Although this was a rumor earlier today, it is now confirmed as I just received the official announcement from Leica. The M9 firmware version 1.116 is now available for download for registered owners of the M9. Leica M9 Downloads Index with full info about the camera, detailed instructions and available downloads. Please give us a call if you have any questions. Faster zooming into the last picture taken. Speed of SD-card formatting enhanced. Image quality of “thumbnail” pictures improved. correction at ISO 2500, interpolated for intermediate ISO steps. Transfer of large data amounts to a Mac in USB-Mass storage mode. Sensor cleaning mode with battery capacity <50%. Function “Deleting all images” while zoomed picture is shown on screen. Function “Deleting all images” from a SD card with non-M9 pictures on it. Interrupting a long exposure by switching off the camera. Zooming into pictures with “Vintage B+W” setting. Firmware uprades are part of routine maintenance and give you all the latest and updated functionality for your camera. Bergen County Camera is always ready to assist you to upgrade your firmware. Many times when can do this on the spot, but it is always better to call ahead and let us know when you are planning to stop by. 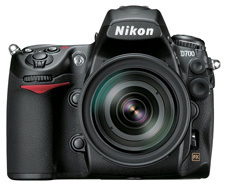 If you are more DIY, you can visit the Nikon D700 download page and choose the v1.02 firmware and follow the instructions. The process is pretty straightforward and takes less than 15 minutes. When ISO sensitivity settings>ISO sensitivity auto control in the shooting menu is set to On, the Maximum sensitivity option can now be specified in steps of 1/3 EV, 1/2 EV or 1 EV, according to the Custom Setting b1 ISO sensitivity step value setting. The length of time the camera waits before adjusting focus in response to sudden changes in the distance to the subject can now be selected from 5 (Long) , 4, 3 (Normal), 2, and 1 (Short) from Custom Setting a4 Focus tracking with lock-on. With the increase in the number of options for Custom Setting a4 Focus tracking with lock-on, this item will be set to 3 (Normal) after firmware upgrade. Adjust this setting as needed. When the camera’s AF-ON button is pressed, the monitor turns off and a focus point can now be selected using the multi selector. When the MB-D10 AF-ON button is pressed (with AF-ON selected for Custom Setting a10 AF-ON for MB-D10), the monitor now turns off and a focus point can be selected using the multi selector. A Use GPS to set camera clock item has been added to the GPS item in the setup menu. When Yes is selected, date and time information acquired via connection to a GPS device is used to set the camera’s internal clock. After selecting Yes for the first time, turn the camera off and then on again to reacquire GPS data. When On is selected for Long exp. NR with shooting at shutter speeds slower than 1 s but faster than or equal to 8 s, it did not function properly. This issue has been resolved. The focus point was sometimes not displayed even when focus was acquired with playback of images captured with continuous shooting. This issue has been resolved. When the virtual horizon was displayed with shooting in live view tripod mode and live view was then cancelled, the focus point displayed in the monitor could not be moved. This issue has been resolved. When [M] exposure mode was used in live view shooting via Camera Control Pro 2, the electronic analog exposure display did not function. This issue has been resolved. Attn: 5D Mark II Owners! As much as we are nerds here at the camera store, we’re generally pretty jaded when it comes to firmware updates. It’s usually the standard “fixes banding issues when shooting at ISO 3200 in RAW mode with the white balance set to cloudy and the moon is beginning it’s waxing phase”. But! Every now and again they like to surprise us with something that’s actually useful. Canon just released a firmware update which deals specifically with HD Video in the Canon 5D Mark II. Normally, when doing video with the Mark II, there’s not a lot in terms of manual controls. Actually, none at all. This new firmware update gives you full manual freedom when doing video. If you’re having trouble installing the firmware, feel free to stop by the store and we’d be more than happy to help you out.